The blog has covered a number of hand tools over the years, but these have always been military marked and for army or air force service. Tonight we have another tool to look at that is a little different in that it is a tool produced during wartime, that was most likely for civilian use. This socket attachment is undated, but stamped ‘War Finish’: This is an extension bar for a hex-drive socket set as it has a large head to go over a nut: The head also has a hole cross bored through it to allow a metal pry bar to be fitted here to increase the torque when tightening or loosening a stubborn nut. The opposite end of the tool has a hexagonal fitting to allow it to be fitted into the socket wrench: Stamped on the body is a number ‘2097’: And most importantly for us the term ‘War Finish’: War Finish was never an officially government sanction economy procedure, but most tool manufacturers could not get hold of their usual high quality raw materials to coat tools in either paint or chrome to stop them rusting. Other changes made might include not cleaning up castings as well as pre-war standards or reducing the number of processes needed to finish the tool so it could be made quicker at the expense of looking more crude. 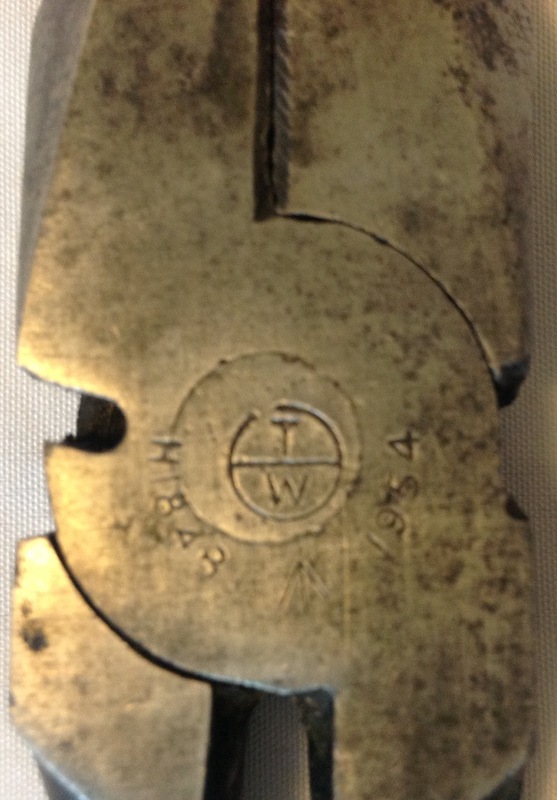 The term ‘War Finish’ was applied to indicate to customers that this tool was not to the grade one might expect pre-war, but the company was working under wartime conditions and trying to save labour and materials in its manufacture. It must be said that there was never anything wrong with these tools in how they functioned, but rather in how they were finished. This particular tool has the trade mark ‘Britool’ which indicates it was made by the British Tool and Engineering Company, who had copy-writed that term back in 1920. This Wolverhampton company has a following amongst collectors of old tools, and this thread might be of interest if you wish to look into its history in more detail and see some of the range of products the company manufactured. This entry was posted in equipment, Hand Tools, Home Front, WW2 on August 7, 2018 by hatchfive. It is always nice to find a piece of militaria you have been trying to find for a long time, even more so when it is extremely cheap! Long term readers will know I have a Vickers Machine Gun spare parts case and I have slowly been building up the contents inside, one item of the spares case is an innocuous pair of 6” side cutting pliers. Last year I bought a pair of marked pliers over the internet and unfortunately when they arrived they turned out to be too large, therefore I was very pleased to find a marked 6” pair for £1 this week: In form they are nearly identical to the pair we looked at here, just smaller. 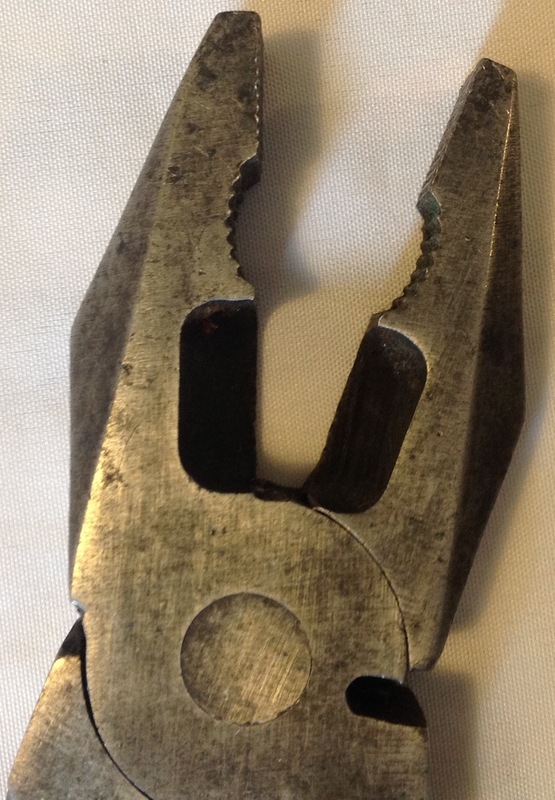 They are dated 1943 and stamped with the /|\ acceptance mark: Although it is faint, a manufacturer’s stamp can also be seen, unfortunately I can only make out the –“& Sons” part of the name: I am sure these pliers were a general purpose tool, rather than being specifically manufactured with the Vickers gun in mind. Having said that they are certainly part of the spares kit, as can be seen on the excellent ‘Vickers Machine Gun Collection and Research Association’ website here. The pliers were carried in the spare parts wallet which in turn was carried inside the Spare Parts Case. I imagine these tools actually survive in quite large numbers- after all they are still an effective pair of pliers for use outside the military. Unfortunately as can be seen from this pair, the markings are quite small and it is often the case that you will need to check many dozens of pairs of pliers to finally find a military marked one- but that’s the fun of collecting! This entry was posted in equipment, Hand Tools, WW2 on August 25, 2017 by hatchfive. Pliers are intended for straightening, bending, twisting or cutting soft wire or very thin rods, also for grasping and turning or pulling small components which are not likely to suffer from teeth marks made by the jaws. They must not be used for the purposes of tightening small nuts or screws, or for cutting hard steel wire. The commonest use of the pliers on a motor vehicle is the removal and replacement of split pins and locking wire. When cutting thick wire or split pins, use the shears on the back or front of the pliers, use the side cutters for soft thin wire: Do not attempt to cut thick wire with the side cutters by driving the cutters through the metal with a hammer. 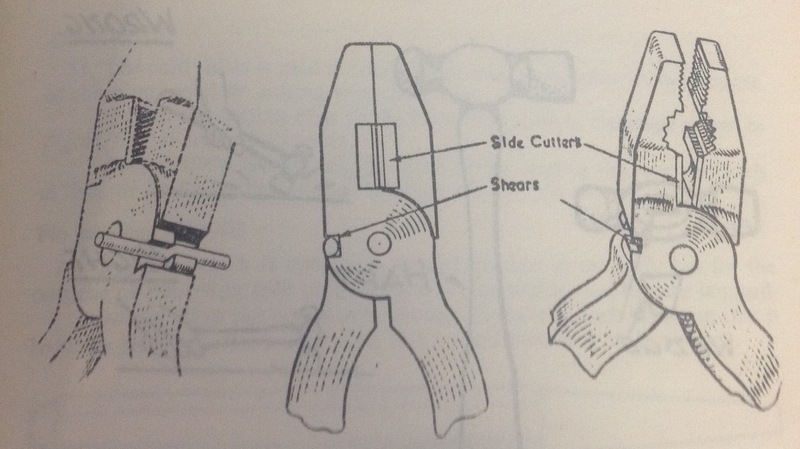 Reason: Use of excessive force causes damage to the cutters and distorts the jaws of the pliers. This entry was posted in British Army, Hand Tools, Post WW2 on July 1, 2016 by hatchfive.